Welcome to Eagle's Pointe Apartments near Kirkwood Community College, in Cedar Rapids, IA. Eagle's Pointe Apartments in SW Cedar Rapids, IA has everything for today's busy lifestyles. From our convenient college leasing options to our spacious two bedroom apartments, we have just what you need. Are you looking for the ultimate experience from excellent customer service and prompt maintenance staff? You will find it at Eagle's Pointe! Our apartment homes are located on Kirkwood Blvd SW, only 10 minutes from Downtown Cedar Rapids! 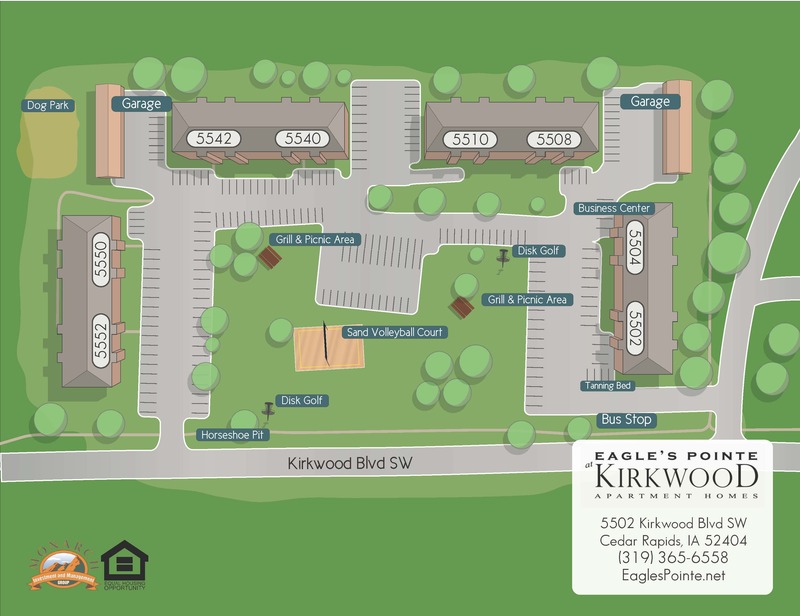 We are directly across the street from Kirkwood Community College and close to a variety other college campuses including Coe College, Kaplan University, Kirkwood Community College and Mount Mercy University. Due to Eagle’s Pointe Apartment’s proximity we offer accommodations for our student population that you can find below in “Student Accommodations”. The proximity to the colleges bolsters this area full of life and businesses alike! You can quickly walk to coffee shops, pizza restaurants, Subway and much more! Furthermore we are located only 5 minutes away from the Tait Cummins Sports Complex in Cedar Rapids! We offer very spacious two bedroom apartments to suit any lifestyle. Our completely remodeled luxury apartments feature maple cabinets, marble-style counter tops and brushed nickel throughout! Grand open floor plans with balconies off your living room with large private bedrooms, and updated kitchens with appliances. Our apartments for rent come with all the amenities and are cable ready and come with clean carpeting, dishwashers, large closets, microwave, patio/balcony, and a refrigerator! We are pet friendly so bring your furry friends to tour your new home! If you like fun, you'll find it at Eagle's Pointe Apartments. Our community is dedicated to listening and fulfilling your living requirements and for this reason we provide on-site maintenance and management to take care of your requests. In order to satisfy all our tenant’s necessities we offer a wide variety of community amenities within our apartments. If you’re one of the active types you’ll likely find yourself outdoors enjoying our BBQ/Picnic area, bike racks, court yard, off-leash dog park and volleyball court! However, do not fear we offer basic essentials we know you need as well such as a business center, central A/C, garages, laundry facilities, public transportation, recycling and more! Whether you are catching rays in the tanning bed, grilling burgers or brats with your friends, or drumming up some of your neighbors for a game of sand volleyball, Eagle's Pointe Apartments offers the ultimate college experience! We give today's student the freedom to study hard, live life and take in every minute of their college experience. Enjoy one of our many resident functions and have a little quiet time for studying all in the luxury of your new Cedar Rapids apartment community. Tired of the noise from parties on the weekend? Just looking for a place to study in peace? Eagle's Pointe Apartments offers a designated quiet building to our community. If you choose to live in this community option, residents sign a separate addendum stating that they will abide by the rules in this quiet lifestyle alternative to the college experience. Not a traditional student? Not a student at all? That's ok! All individuals and families are welcome to apply for the opportunity to call Eagle's Pointe Apartments home! You've made it! Now make your next big decision your best! Not convinced? Don’t just take our word for it. Take a peak at our reviews on rent.com earning us an average of 4 out of 5 stars! Amazing savings on BTB's and full leases! Move in before April 30 to a 2-bedroom apartment for only $699 per month or a BTB for $325! PLUS, pay no rent until May!